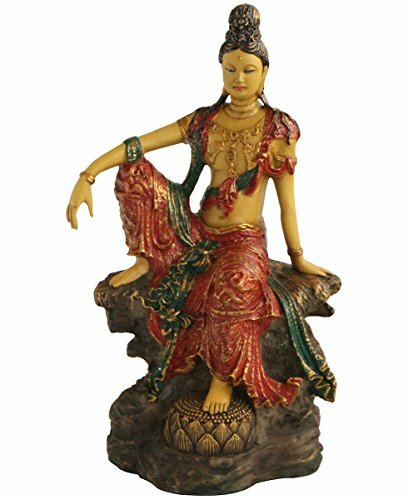 This Avalokiteshvara Kuan Yin figurine is 6" tall, with a base of 4.5" by 2.5" in dimensions. The Guanyin measures 3.5" wide and 1.75" deep. 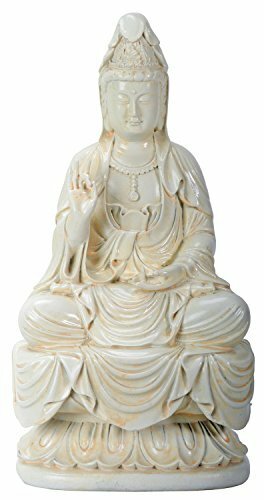 This Benevolent Water And Moon Goddess Kuan Yin Bodhisattva Statue stands at 7" tall, 4" wide, 3.25" deep approximately. 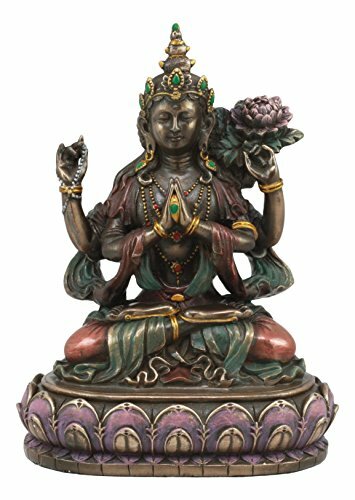 This Benevolent Water And Moon Goddess Kuan Yin Bodhisattva Statue is made of designer composite resin, hand painted and polished individually. The color finish on this figurine is cream/off white. Kuan Yin, originally known as Avalokiteswara ('the Lord who regards'), is a highly revered manifestation of the Buddha who appears in Chinese scriptures around 400 A.D. Kuan Yin means 'one who hears the cries of the world' and personifies the compassion of the Buddha for the needy. She is the embodiment of the yin principle. She is usually represented as a young female deity but she has the power to assume whatever form necessary in order to carry out her vow which is to appear in any way necessary to lead beings out of suffering. She is often shown holding a vase containing the waters of compassion, the lotus flower of enlightenment or the jewel of three treasures. KuanYin is the bodhisattva associated with compassion as venerated by East Asian Buddhists, usually as a female. The name Kuanyin means `Observing the Sounds of the World`. 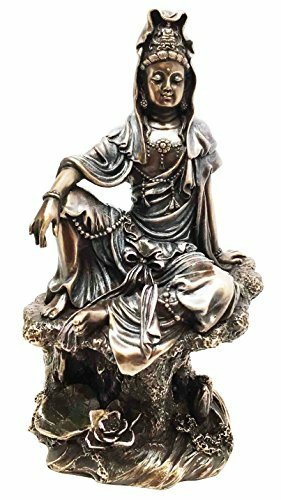 This beautiful cold cast resin statue of Kuan Yin sitting atop a craggy rock outcropping in a relaxed pose, has a beautiful metallic bronze finish. It is hand accented with colored enamels to bring out the fine detail, and the front is carved with the Heart Sutra in Chinese hanzi. The statue measures 16 inches tall, 7 inches wide and 5 1/2 inches deep. It looks great in living rooms, offices, bedrooms, even in kitchens. Kuan Yin, originally known as Avalokiteswara ('the Lord who regards'), is a highly revered manifestation of the Buddha. She first appears in Chinese scriptures around 400 A.D. Kuan Yin means 'one who hears the cries of the world' and personifies the compassion of the Buddha for the needy. She is usually represented as a young female deity but she has the power to assume whatever form necessary in order to carry out her vow to lead beings out of suffering.In this statue Kuan Yin is illustrated in a pose of meditation while seated on an elegant dragon throne. The statue measures 22 inches high, 13 inches wide, and 10 inches deep and weighs about 26 pounds. The piece's large size makes Kuan Yin a stunning presence for any space. She can be placed in your house sanctuary or add distinction to your entryway. 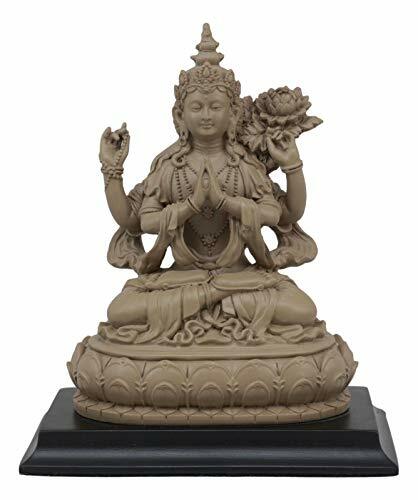 * Elegant statue of Kuan Yin on dragon throne* Finished in ivory stone color* Made of bonded stone* Measures 22 x 13 x 10 inches* Weighs about 26 pounds * Suitable for indoors or outdoorsThis it handmade and hand finish. Variations in surface design, color and appearance are the natural results of its handcrafted construction. If placed outside, natural variations to surface will occur over time. Cover during freezing weather. This Avalokiteshvara Kuan Yin figurine is 7" tall, 5.5" wide and 2.5" deep in dimensions. The base is 5.75" by 3.5". This Avalokiteshvara Kuan Yin figurine is made of designer composite resin, hand painted and polished individually. The sculpture is finished in Faux Ivory Color. Color tone may vary from pictures. Guanyin is the bodhisattva associated with compassion as venerated by East Asian Buddhists, usually as a female. The name Guanyin is short for Guanshiyin, which means "Observing the Sounds (or Cries) of the World". She is also sometimes referred to as Guanyin Pusa (simplified Chinese: 观音菩萨; traditional Chinese: 觀音菩薩; pinyin: Guānyīn Púsà; literally "Bodhisattva Guanyin"). Some Buddhists believe that when one of their adherents departs from this world, they are placed by Guanyin in the heart of a lotus, and then sent to the western pure land of Sukhāvatī. It is generally accepted among East Asian adherents that Guanyin originated as the Sanskrit Avalokiteśvara (अवलोकितेश्वर). Commonly known in English as the Mercy Goddess or Goddess of Mercy, Guanyin is also revered by Chinese Taoists (or Daoists) as an Immortal. However, in folk traditions such as Chinese mythology, there are other stories about Guanyin's origins that are outside the accounts of Avalokiteśvara recorded in Buddhist sutras. 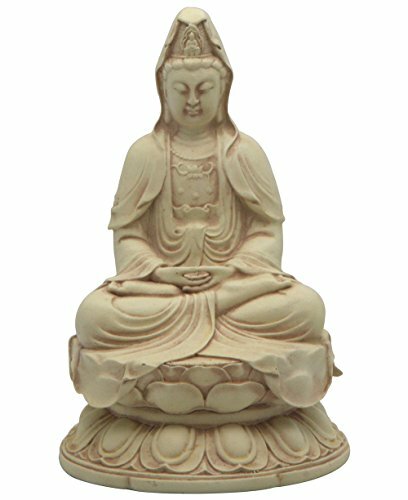 This Beautiful Water And Moon Kuanyin figurine stands at 7" tall, 4"long, 3.5" wide approximately. 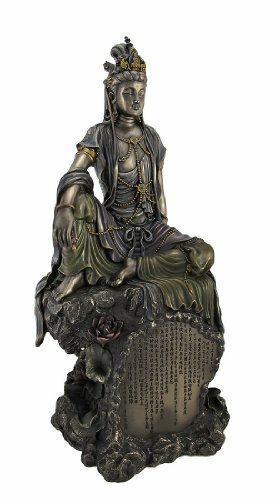 This Beautiful Water And Moon Kuanyin figurine is made of designer composite resin, hand painted and polished individually. 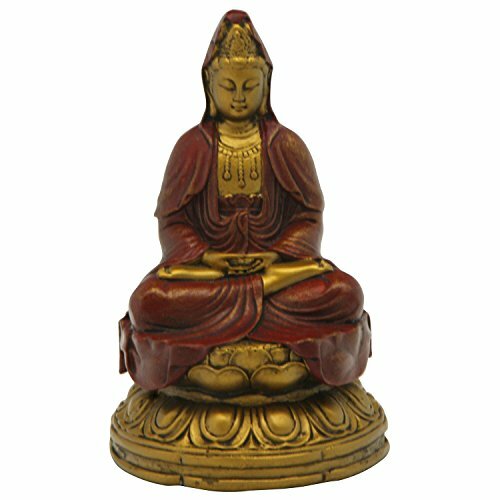 This Avalokiteshvara Kuan Yin figurine is 7" tall, 5.5" wide and 2.5" deep in dimensions. The base is 5.75" by 3.5". Kuan Yin, originally known as Avalokiteswara (the Lord who regards), is a highly revered manifestation of the Buddha who appears in Chinese scriptures around 400 AD. Kuan Yin means "One Who Hears The Cries of the World" and personifies the compassion of the Buddha for the needy. She is the embodiment of the yin principle. She is usually represented as a young female deity but she has the power to assume whatever form necessary in order to carry out her vow which is to appear in any way necessary to lead beings out of suffering. She is often shown holding a vase containing the waters of compassion, the lotus flower of enlightment or the jewel of three treasures. Kuan Yin, originally known as Avalokiteswara (The Lord who Regards), is a highly revered manifestation of the Buddha who appears in Chinese scriptures around 400 A.D. Kuan Yin means One Who Hears the Cries of the World and personifies the compassion of the Buddha for the needy. She is the embodiment of the yin principle. She is usually represented as a young female deity but she has the power to assume whatever form necessary in order to carry out her vow which is to appear in any way necessary to lead beings out of suffering. She is often shown holding a vase containing the waters of compassion,the lotus flower of enlightenment or the jewel of three treasures. Kuan Yin, originally known as Avalokiteswara (ëthe Lord who regardsí), is a highly revered manifestation of the Buddha who appears in Chinese scriptures around 400 A.D. Kuan Yin means ëone who hears the cries of the worldí and personifies the compassion of the Buddha for the needy. She is the embodiment of the yin principle. She is usually represented as a young female deity but she has the power to assume whatever form necessary in order to carry out her vow which is to appear in any way necessary to lead beings out of suffering. 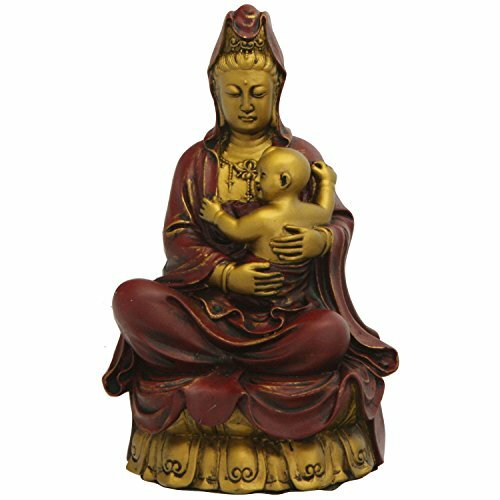 Here, Kuan-Yin is depicted holding a baby which represents her role of Mother Goddess, mother of all humans and protector of children. Kuan-Yin is a manifestation of Buddha, known as a figure of compassion and mercy. She appears in all sorts of forms, but is most often represented as a young woman. As she sits, let her watch over your outdoor space with ease. This garden statue measures 18.5 inches high, allowing Kuan-Yin's benevolent presence to pervade any space she’s placed in. In this figurine, Kuan Yin is imaged seated on a crescent moon, pouring down compassion on the earth below. Her right hand is raised in blessing. A different and serene vision of the Goddess of Compassion blended with the energies of ancient Moon Goddesses. The figures are individually cast by hand, each one polished to highlight its details. The cold cast bronze finish gives the statue an elegance feel. From atop a seat of fragrant lotus flowers, our legendary Asian bodhisattva in flowing white robe welcomes all in need of comfort. A serene work for home or garden, our Toscano exclusive in designer resin is awash in beautifully muted shades of green, lavender, faux bronze and stone. 7.5"Wx6.5"Dx12"H. 2 lbs. Avalokiteśvara (Sanskrit, "Lord who looks down", Wylie: spyan ras gzigs, THL Chenrézik) is a bodhisattva who embodies the compassion of all Buddhas. This bodhisattva is variably depicted and described and is portrayed in different cultures as either female or male. In Chinese Buddhism, Avalokiteśvara has become the somewhat different female figure Guanyin. In Cambodia, he appears as Lokeśvara. Avalokiteśvara is one of the more widely revered bodhisattvas in mainstream Mahayana Buddhism as well as unofficially in Theravada Buddhism. Avalokiteśvara (Sanskrit: अवलोकितेश्वर "Lord who looks down", Wylie: spyan ras gzigs, THL Chenrézik) is a bodhisattva who embodies the compassion of all Buddhas. This bodhisattva is variably depicted and described and is portrayed in different cultures as either female or male. In Chinese Buddhism Avalokiteśvara has become the somewhat different female figure Guanyin. In Cambodia, he appears as Lokeśvara. Avalokiteśvara is one of the more widely revered bodhisattvas in mainstream Mahayana Buddhism, as well as unofficially in Theravada Buddhism. 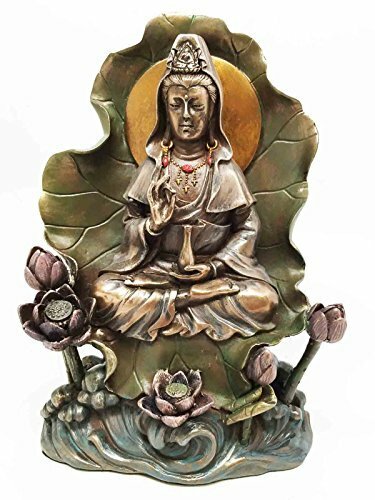 This gorgeous Bronze Kuan Yin With Dragon Buddhism Display Statue Figurine has the finest details and highest quality you will find anywhere. 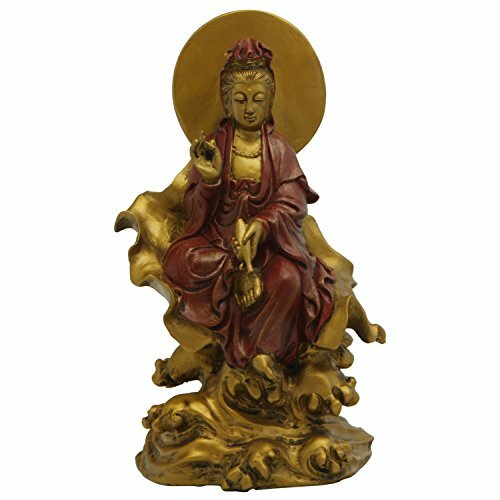 The Bronze Kuan Yin With Dragon Buddhism Display Statue Figurine is truly remarkable. Product is crafted with: Resin. ITEM SKU: SS-Y-7828. New Products at Star Woman Crystals. Statues and small stocking stuffers. Great gifts. 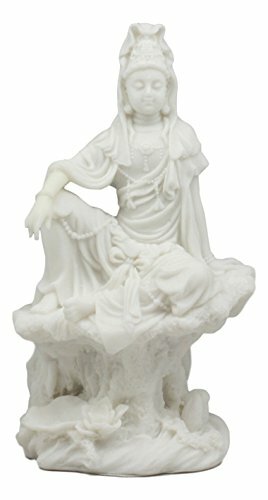 Looking for more Seated Kuan Yin Statue similar ideas? Try to explore these searches: Flapper Feather, Army Brat Shoes, and Court Girls T-shirt. 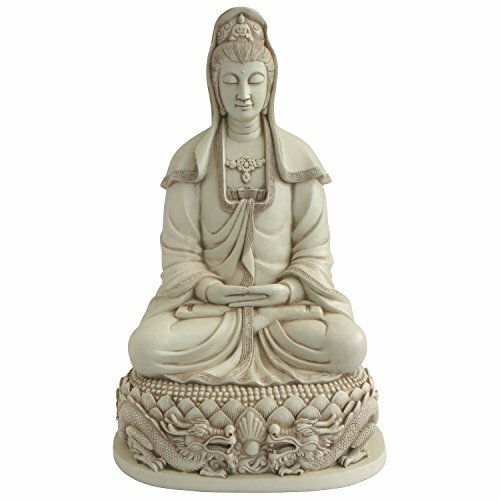 BlesDeal.com is the smartest way for online shopping: compare prices of leading online stores for best Seated Kuan Yin Statue gift ideas, Seated Kuan Yin Statue deals, and popular accessories. Don't miss TOP deals updated daily.